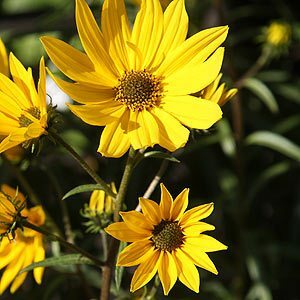 The perennial sunflower may not have as big a flower as its relatives, but it does have masses of them over along period in autumn, and it is a tough perennial at that. Helianthus angustifolius can still reach a good height, 2m + depending on conditions, and once the first flowers begin fade you can simply cut it back for a second flush. Attractive yellow daisy like flowers with dark centres attract bees, which is always a good thing for any garden, and the deep green foliage acts as a good contrast. A sunny position in a humus rich soil is best for this easy care perennial. Cut back to the new buds after the first flowers begin to fade for a second flush. As the foliage begins to die back in winter, simply cut it back to the ground. Propagation by division is easy, and in fact they will self seed as well, so deadhead after flowering if you do not want then to spread.